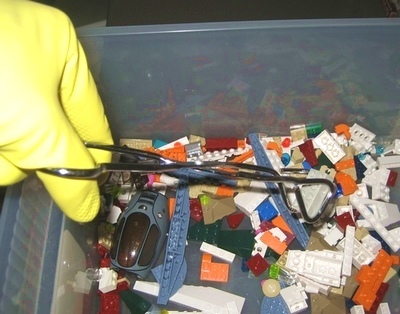 What would you do if you found a nasty old Mega Blok as you were sorting your LEGO collection? Dave Lartigue experienced just such a terrifying situation and took drastic measures. Isolating and disposing of the offending (offensive) brick seems like a short-term solution, however. As a long-term solution, I suggest we invade Canada. I prefer the tactic of holding them up to a wood stove until they melt into an oozing glob. I’ve experienced this before. I like the wood stove method best as well! Whenever I accidentally touch one, I scream and run to the nearest corner. When I get a hold of my self, I nervously search the room for a shoe and start slapping the abomination. I actually have two that I LOVE, I keep them because LEGO will never make that piece (and they are small). Thanks, wunz! David! How could you! I use Mega Blocks. They do this really nice 1×1 round piece with a handle on it which makes a great magifying glass to Sherlock Holmes. Oh yeeeaaahhhh… I’ve seen those. (I never dared keep one). Regarding the long-term solution, the last time you took the Great White North on, it did not go so well for you. And most of your military otherwise engaged. Then again, if you were to get our Walmarts to sell LEGO again, I might be willing to greet you as liberators. America has conveniently forgotten about getting our butts handed to us by Canada. That’s not one they teach in school down here! And your comment made me LOL. Ha! America never loses, we just change what our mission goals are. Poor megabloks. I think they get a rough deal. Sure they’re not LEGO, but I’m all for fair competition in the market. I was just given a large box of Lego, fake-Lego, and random non-Lego stuff. At this point I have almost two grocery bags of “Nogos” as I like to call em, with at least half a bag more if the trend continues. Then the Lego pieces get sorted for blatantly specialized stuff and stuff with animal faces on ’em. Whenever I find a megablok in my lego box I get pliers and rip it’s life out!